This week, I want to discuss the importance libraries have when it comes to business and the impact they have on small business owners. Restaurants: they’re looking for the best deals on cooking equipment, new recipes, maybe printing out copies of their new menu. Candle shop: they’re trying to find out what scents are trending, how to make them, and the best supplier for candle jars. This kind of thing applies to almost any boutique, really. I could go on for another 3 pages at minimum, but I have a particular shop I want to talk about. This week’s post isn’t just about a store that brings in money; it’s about a venture that gave somebody their confidence back. Meet Ashley, her husband Nigel and their son, Alistair. Ashley has worked full time and part time in the past to help with the household. However, she suffers from a number of health issues, especially back problems. Even after several surgeries, her back has gotten worse in the past few years. The spinal flareups and back pain make it difficult to stand or walk for very long. By difficult, I mean difficult enough to go on disability because she can’t work a normal job. Meanwhile, her husband works extra shifts when possible. When Ashley went on disability, she became forlorn. She couldn’t contribute to the household finances like before, and that made her feel powerless. She could still walk around enough to chase Alistair and take him out to play, so she focused on being a mom. Being the cool and frugal mom that she is, she took Alistair where he could play, socialize with other kids, and engage in learning activities, all for free: AT THE LIBRARY. Ashley gets to sit and rest her back, Alistair gets to have Story Time, and everybody wins. While browsing through arts and crafts books with Alistair, Ashley chanced upon a book on sewing. Already skilled in sewing, Ashley picked it up and found some patterns for things she wanted to make. Since we need fabric for this kind of stuff, she went to the fabric shop looking for something to jump out at her. It didn’t take long for her to find every nerdy fabric in stock: Doctor Who, Batman, Wonder Woman, Superman, Star Trek…FYI, nerdy stuff is awesome. Sorry, voice in my head. After Ashley made some stuff, friends and family commented on how cool her items were. If people like them and she’s good at making them, maybe she can…sell them? To someone who has the skills and can stay home all day to do it, something like this could be a veritable gold mine. Like any savvy business person, she knew she couldn’t rely on just making one or two items – she needed to diversify. If I’m going to do this, I’m gonna need more patterns to make different items. TO THE LIBRARY! Using books she got from the library while taking Alistair and using her library card online at home to help her look up other patterns, Ashley put on some montage music and got to work. Time to go full Eye of the Tiger. Infinity Scarves? She started with sports teams, nerdy stuff, and just regular chic. Florida library peeps, that is indeed an FSU scarf. Again, it’s about diversifying your inventory. The next big item that kept turning her friends’ heads? Her marvelous tote and sling bags – I say marvelous because I have one. YES, that bottom right bag is a Super Mario print. I have a Batman one. Then bags, switches, aprons, mitts, pads, and pot holders/trivets it is. Give the people what they want! I like the Harry Potter switch. With products made and ready to go, it’s time to get serious and make this a legit shop. The name of this endeavor? Phoenix Fire by Ash. The Phoenix is the comeback kid of the animal kingdom, right? I wonder if Survivor is available to make a song called Phoenix Fire. Have they done anything since that Starbucks commercial? You know the one I’m talking about. This was like 2006, people. Next step: finding ways to sell this stuff once it’s made. Thanks the internet, making and selling things is easier than ever on places like Etsy. If you’re not familiar with Etsy, it’s pretty much a website where you can buy and sell things you make. Like anyone starting a business, Ashley wasn’t sure about how to go about it. How much should she charge for her items? How should she market this shop on Etsy? How does she get the most out of this venture? It’s not like they make a “how to sell stuff on Etsy” book. I guess it’s time to head back to the library. As long as we’re doing an Etsy page, we’d better expand our reach and market on our Facebook Page. What about in person though? Many marketing experts will tell you that word of mouth is often considered the most trustworthy and powerful way to reach people. How many of you have tried a product or read a book because a friend, recommended it? This is the kind of groundswell we need to get going. Marketers will also tell you the old adage, “location, location, location” – being out where your customers can see you. Lucky for Ashley, she’s got the perfect location. Tampa is a very large city and is home to numerous comic book conventions…you know, the kind that have vendor booths selling you all the nerdy and geeky things you want. This photo was taken before the convention started. I’d show you an after photo, but you all know what a bare table looks like. Spoilers: her stuff was popular and flew off the shelves. It’s a ton of work to handle all this, but Ashley isn’t alone. With the help of her parents, Nigel, friends – and even Alistair – she’s been able to keep up with demand. A special shout-out goes to her mom, Cindy! She sews, she irons, shes helps set up and take down booths when Ashley has flareups, she keeps Alistair busy so she can concentrate, she does anything that’s needed. Seriously, I mean anything. When there was a problem with the cake at Ashley and Nigel’s wedding, she fixed it…the “mama grizzly, you don’t want to know” kind of fixed it. Those are some tough cookies, right there. Most people would be satisfied, but not Ashley. Like any shrewd but cunning entrepreneur, she knows it’s not about making money – it’s about making connections. Ashley made many new friends, but also gave some promotional items away. One such item included a set of Wonder Woman pot holders trivets to legendary comic artist Jose Delbo. He’s most famous for drawing Wonder Woman, but he’s done Batman, Spiderman, and the Beatles. She simply gave them to him because she’s a big fan of his work, but it turned out to be a great investment. Delbo appreciated the gift so much, he gave Ashley a signed print and signed a pair of…trivets for her! So where to from here? Another advantage of face-to-face business at conventions is getting to hear what people want. Neck pillows, bedding, baby wear, walker pouches? You got it. Fellow vendors or people who wear lanyards and wristlets? She’s got you covered. No spare fabric is wasted. Whether it’s one of her usual items or a custom order, her attention to detail is impeccable. That’s right, custom orders. Don’t like what you see? She’ll make it. 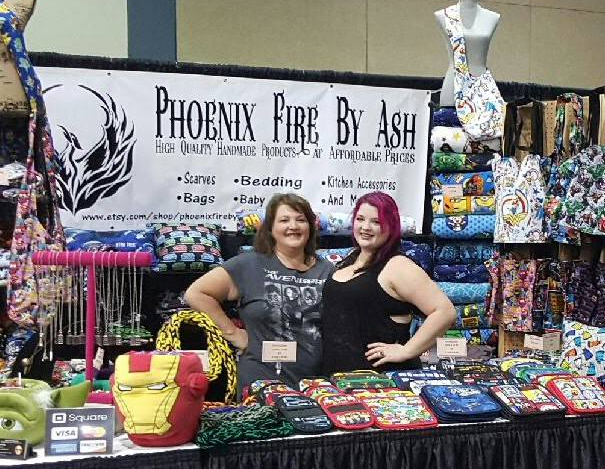 Check out all of her items on Phoenix Fire by Ash and Facebook. Remember, Easter is right around the corner if you need gifts – act now and get your items just in time! Ashley is a proud supporter of libraries, librarians and learning, so she’s made a special offer: if you use the coupon code “brash16” in the next 90 days when ordering, you’ll get 5% off your entire order. It’s been over a year since Ashley started, and it’s only growing. With help from her local library, Ashley was able to turn her time at home into a money-making opportunity. She’s contributing to her family, making use of her talents, and showing the world what is possible when you say “I’m not gonna take it, I’m going to the library”. And best of all, she gets to spend more time with Alistair. I know Ashley isn’t the only success story out there! Know anyone in your life that’s used their library as a business incubator? Comment here or connect with me on Facebook, Twitter and Instagram and they could have an article about them as well! That’s all for this week. I’ll be busy with our upcoming library carnival this coming Saturday, but I should be a little more free after that. Have a safe weekend, everyone!